The 40.17 metre motor yacht Sea Dreams has been sold with John Cohen at Merle Wood & Associates and Executive Yacht Sales representing both buyer and seller. Built in GRP by US yard Northcoast Yachts to a design by Jack Sarin, she was delivered in 1995 and had a thorough refit in 2014. A classic superyacht interior with mahogany panelling teamed with a neutral colour palette by Robin Rose accommodates 10 guests in five well-appointed cabins. 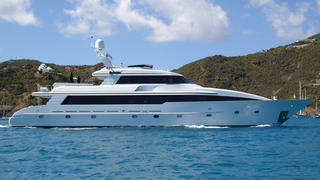 These consist of a main-deck master suite, VIP suite, two doubles and a twin. All cabins have entertainment centres, LCD television screens and en-suite bathroom facilities. Also, eight crew are accommodated in four cabins. The expansive main deck saloon has comfortable seating, a bar and an entertainment centre featuring a 42-inch Fujitsu plasma television and a Kaleidescape server for on-demand audio and video throughout the guest areas. The shaded aft deck is particularly large with a dining table seating up to 14 guests for al fresco entertaining and dining, while up on the flybridge there are sun loungers, a gas barbecue grill, six-person Jacuzzi and a stereo surround sound system. A popular charter yacht, she has twin 2,400hp Detroit Diesel engines powering her to a range of 1,700 nautical miles at her cruising speed of 11 knots and is fitted with Naiad zero speed stabilisers. Sea Dreams was asking $4,495,000.